After covering the Clippers for seven seasons, 2001-2008, for the Los Angeles Newspaper Group, I have some insights on the train wreck of the individual that is Donald T. Sterling. This week, "The Donald" went berserk in an interview with Anderson Cooper and verbally assaulted Magic Johnson and the entire black community. Presumably, he did the interview to apologize to the black community, America and the world, but he made everything much worse. His words and behavior with Anderson Cooper were 100 percent consistent with the Sterling I knew during my seven years writing about the Clippers. "Honesty is the best policy" is a good aphorism when you are a respectable individual, but when you're egotistical, racist and delusional, it's time to clam up. During my stint covering the Clippers, Sterling was shielded well from me and most media. In essence, he was well-shielded until this year, and keeping him out of the media was the only way his franchise could function. For the longest time, the mainstays in the Clipper organization were DTS, CEO Andy Roeser, general manager Elgin Baylor and pr director Joe Safety. Safety left this June, and DTS and Roeser were forced out this year. Baylor is a slightly different story, as he left in 2008, the year I coincidentally moved off the beat. In a way, when Mike Dunleavy became coach/general manager, and thus getting Elgin out, it was a major step in getting the wheels in motion to Sterling's collapse. 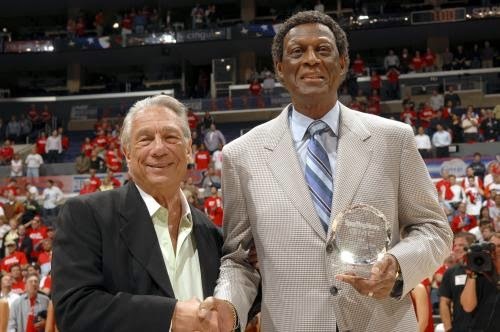 Elgin Baylor is one of the most upstanding individuals I have ever met, and the "off-the-record" stories he told me made me realize that I was in the presence of secular godliness. Yet he seemed like a normal, down-to-earth guy with his personality. One story he told me that comes to mind is when he played tennis with the Kennedy's in Cape Cod. Another story was his friendship with Neil Armstrong. Elgin was a celebrity in the '60s when access was only granted to a few. It was before the paparazzi infiltrated the elite, and well before the Internet, Twitter and "The Real Housewives of New Jersey Shore." Because of Elgin's past, demeanor and overall dignity, I liked the guy. As a general manager, Elgin wasn't the best, but that was because his hands were tied because DTS ran a discount team for years. Once the NBA's collective bargaining agreement hit, though, it forced teams to spend a certain amount on players, and the Clippers were forced to no longer be the Wal-Mart of the league. Eventually, it wasn't easy, but the Clippers finally gave lucrative contracts to players with Elgin even being voted the NBA's executive of the year in 2006. That year, Sterling got a taste of winning a little bit in the playoffs with Dunleavy coaching, and in essence, Dunleavy soon took on a role beyond a mere coach that involved personnel decisions. I assumed that Dunleavy was going directly to Sterling on decisions, and, despite the majority of his life as a bush-league penny-pitcher, Sterling actually bought into Dunleavy's moves. 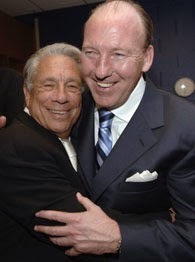 Dunleavy officially took over general manger duties in 2008 when Elgin was replaced after 22 years as the Clippers' general manager. This was the first step to Sterling being a shielded pariah to an international a-hole phenomenal pariah that has surfaced the past few weeks. Perhaps it was just a matter of time before Sterling came crashing down somehow. In a way, it is a testament to the professionalism of Elgin, Joe Safety and Andy Roeser that they kept the Clipper machine sailing so long with Sterling always being a wacko. Each had been with the organization for at least 20 years, and that length of stay for three guys in those positions in professional sports is unheard of (especially for a general manager on a perpetually losing team!). Actually, I realize that these past two blogs are much different for the Snooze Button Generation (TM). With Sterling acting the fool for the entire world to see, it brought back memories of my foray into the NBA. On one hand, writing about pro basketball for seven years was fun, quirky, a learning experience and sometimes inspiring. At the time, I cared about what I was doing a lot — it was my job. Looking back, I don't regret having that occupation, but I eventually felt empty with the job. It was like having cotton candy for dinner.